Uncover how you can use the arts to both meet your arts standards and deepen academic learning. Sharanya Sharma’s second-grade class at Two Rivers Public Charter School in Washington, DC, surveyed people at Reagan National Airport to find out what they knew about how airplanes fly. They discovered that most people don’t know how planes stay in the air. “We’re trying to teach people how to learn the physics of flight,” adds Paz, another student. Sharma partnered with Leah Quinter, an elementary visual arts teacher, to teach the physics of flight. 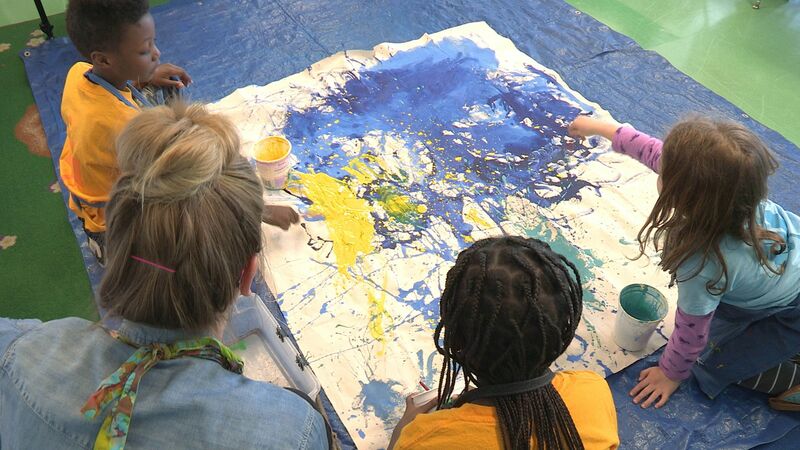 Their final product: a large, whole-class acrylic painting that shows the four forces of flight—thrust, lift, gravity, and drag. 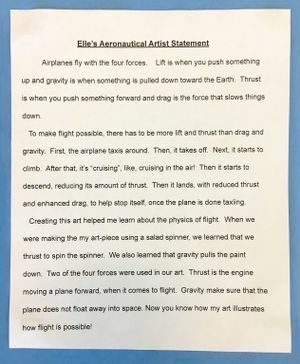 The painting will be displayed at Reagan National Airport to solve their problem in science: teaching people at the airport how airplanes stay in the sky. 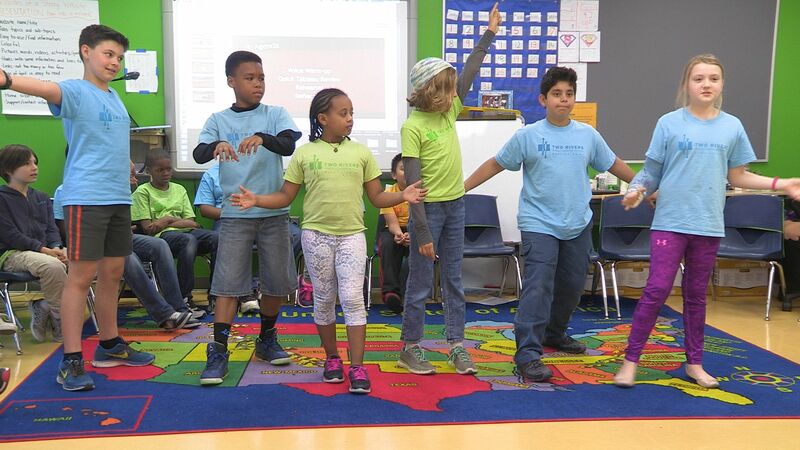 “Particularly in the elementary school, we have a heavy focus on arts integration as it relates to our expeditions—[in depth, content-specific, problem-based learning explorations that are a part of expeditionary learning],” explains Tonia Vines, a dramatic arts teacher. “Twice a year, we integrate social studies or science content with drama or visual arts.” Students have 45-minute visual arts classes twice a week for half the year, and then take drama classes for the rest of the year. Where does this match my subject? Where does this match my content areas? What are my goals for my students, and how can we reach those in both subjects? Share with each other what your standards and learning targets are, look for common goals, and brainstorm topics, guiding questions, and a final art product that can both deepen the academic learning and teach the art content. At Two Rivers Public Charter School, during the three-week orientation each summer, teachers have two 2-hour sessions to co-plan, and when school starts, they have two or three 1-hour sessions during professional development. They continue to plan after school, over email, and via Google Docs. Here is the visual art unit map (PDF) Sharma and Quinter created connecting the four forces of flight to art. Once you’ve decided on a final art product, make a model. “We believe in testing it first ourselves,” says Sharma. “If we’re having fun and learning from it, then it might work with our kids. If we’re bored, then we go back and start again.” Creating a model not only gives you experience with the process but also shows your students an example of what great work looks like and what they’re striving for. Use the same reference materials. Ask their students what they learned that day in the other class. “She’s asking them what they did in art, and I’m asking them what they did in science. That’s been helpful,” reflects Quinter. Marble Experiment: Quinter’s students started with a copier paper box lid. They put paper, two to three drops of tempera paint, and a marble inside. Students grouped into pairs, moved the lid around, and watched how the marble interacted with the paint. “We rolled the marble around, and it made the lines of thrust to go forward because thrust means to go forward,” explains Paz. During your experiments, ask your students guiding questions. Ask them what they’re seeing and have them explain why. Challenge them -- say, “Is it this? Is it not that?” advises Quinter. Step One: Begin by showing your students real artists statements. Have them analyze what does and does not make a good artist statement, and ask them what they should include in theirs. Step Two: Have your students critique each other’s artist statements: What word choices did they use? How did they make their artist statement come alive? In what ways did they describe their artwork? 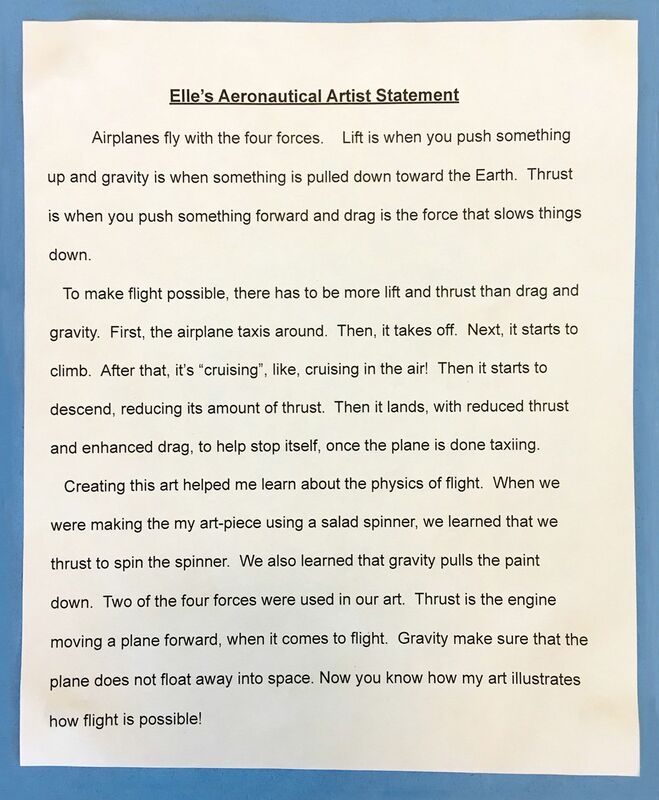 For each art experiment, every student writes their own artist statement, and they use those critiques to inform their collaborative artist statement for their final product.